Have the doctors encountered every possible diaster? Has the Grey’s Anatomy TV show been cancelled or renewed for a 16th season on ABC? The television vulture is watching all the latest cancellation and renewal news, so this page is the place to track the status of Grey’s Anatomy, season 16. Bookmark it, or subscribe for the latest updates. Remember, the television vulture is watching your shows. Are you? Airing on the ABC television network, Grey’s Anatomy stars Ellen Pompeo, Justin Chambers, Chandra Wilson, James Pickens Jr., Kevin McKidd, Kim Raver, Jesse Williams, Caterina Scorsone, Camilla Luddington, Kelly McCreary, and Giacomo Gianniotti. Though this series has been on the air for 15 seasons, there is still plenty of personal and professional drama to come. Meredith Grey (Pompeo) and the other doctors at Seattle’s Grey Sloan Memorial are faced with life-or-death decisions on a daily basis. This team of healthcare professionals share friendship and sometimes, even more. Together they discover that neither medicine nor relationships can be defined in black and white.. The 15th season of Grey’s Anatomy is averaging a 1.60 rating in the 18-49 demographic and 6.85 million viewers. Compared to season 14, that’s down by 17% and 9%, respectively. Find out how Grey’s Anatomy stacks up against other ABC TV shows. As of April 19, 2019, Grey’s Anatomy has not been cancelled or renewed for a 16th season. Stay tuned for further updates. Will ABC cancel or renew Grey’s Anatomy for season 16? The show is still one of ABC’s top-rated shows so I’m sure it will be renewed. I’ll keep an eye on the ratings and update this page with breaking developments. Subscribe for free alerts on Grey’s Anatomy cancellation or renewal news. Find more Grey’s Anatomy TV series news or other ABC TV show news. What do you think? Do you hope the Grey’s Anatomy TV show will be renewed for a 16th season? How would you feel if ABC cancelled this TV series, instead? Station 19: Cancelled or Renewed for Season Two on ABC? I love the show and the actors. I’m actually not in the typical age range you listed; I’m 63-years-old and my youngest daughter introduced me to the show. She’s 18-years-old. It really teaches you that everyone has problems in life no matter how much status or money they have in the bank. It teaches us that we do have to face our demons and biggest fears! And that we have to learn who to trust; who to stay away from; and who to love! Life’s lessons of the Air!!! 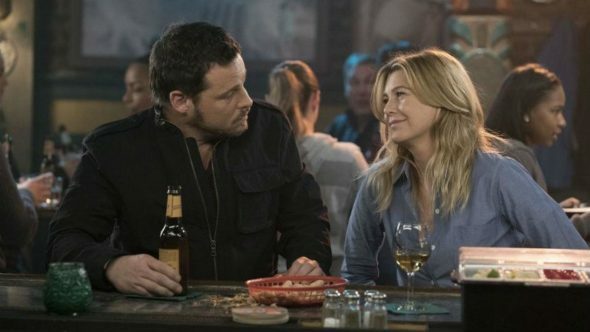 Grey’s has renewed for 16th season, you aren’t updated! It surely will be renewed but it hasn’t been renewed yet.